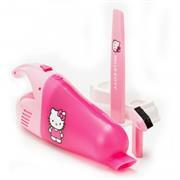 Stay neat and tidy wherever you go with the Hello Kitty Cordless Hand Vacuum! Get rid of all the dust and dirt hidden in hard to reach places. Tackle any mess whether it's big or small.